Drinking alkaline water otherwise known as high pH water is a not so new health fad promising miracle cures from every ailment one can think of. The internet and Youtube is littered with promotional testimonials of these miracle cures. Because of this many desperate people have been lead to buy expensive water ionizers with hopes of experiencing these so-called miracle cures. But what many people don’t realize is there’s both natural occurring alkaline and artificially alkaline water(ionized water). So what’s the difference between natural alkaline water and ionized water? Natural alkaline waters chemical makeup is significantly different from ionized water. Water ionizers split apart water molecules with electricity to artificially create a high pH value. While natural alkaline water has a high pH value because of the presence of key minerals the body needs to function properly, such as calcium, potassium, sodium, and magnesium. If it’s the minerals from alkaline water that the body needs, what could the body be possibly getting from an artificial pH? An artificial pH merely has an abundance of OH- and less H+. Can the body utilize these ions as if they were minerals? Absolutely not. Natural alkaline water is created by streams of water flowing down mountains. In doing so the water picks up alkaline minerals from rocks along its journey. From an organic perspective, artificially alkaline waters are the GMO’s of the water world. If our goal is to seek health and healing from nature, why would we drink or eat anything artificial? 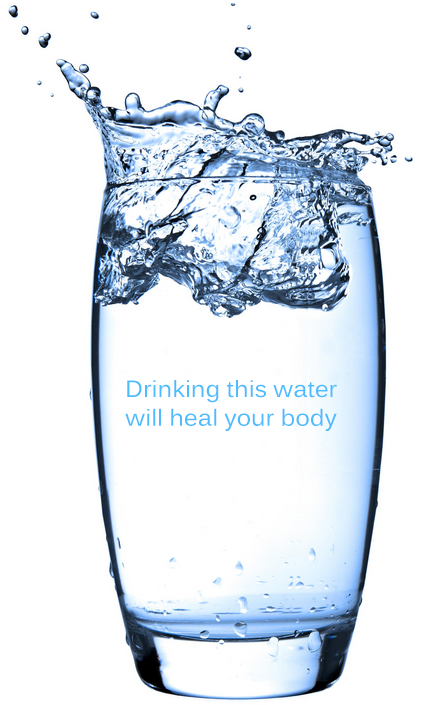 Ionized water only neutralizes acidity where it has direct contact, like in the stomach and small intestine. When consumed daily the small intestine becomes overly alkaline and side effects begin to appear. The most common of these side effects are erratic heart behavior, hypertension, nervousness/anxiety, urinary tract, and bladder infections. I’ve read many reports of numerous individuals being hospitalized for heart conditions that magically disappeared when they stopped drinking ionized water. More severe side effects were observed in clinical studies involving rats. The study revealed injury to cardiac tissue (heart muscle) as a result of drinking ERW (Electrolyzed Reduced Water), or water created by ionizer machines. In my own experience, I’ve attained improbable healing drinking natural alkaline water, using both brands of Icelandic and Evamor which both have an 8.8 pH value. When I first drank alkaline water I felt the oddest sensation, I felt like my throat opened up wider and my body cried out for more and more of the water. The most outstanding of my healing experience was a patch of varicose veins on my left calf disappearing within three months of drinking alkaline water daily. My skin has also become clearer and I feel a general sense of well being. I also started to sleep better. You can buy Icelandic water here on Amazon.com, and you can buy Evamor here on Amazon.com also. All of the benefits described by books and scholars that one would attain by adopting an alkaline restrictive diet, I attained by simply drinking natural alkaline water. Good luck on your journey to Health and Healing! Your avoidance of the Sun(Vitamin D) is destroying your health!